• Review the progress on the Implementation of the Hyogo Framework for Action. Themes of the meeting included mainstreaming DRR into development, initiatives for Mainstreaming Disaster Risk Reduction into National Development Planning, initiatives on Mainstreaming Disaster Risk Reduction into Development Planning of priority sectors, working group discussion on the Next Steps of Mainstreaming Disaster Risk Reduction. With regards to the next steps in mainstreaming DRR, it was discussed that the RCC member countries develop guidelines for mainstreaming DRR into rural housing and land use planning in line with the work already carried out by Maldives, Nepal, Afghanistan, Jordan, Mongolia, Malaysia, Brunei and Korea. In addition, the group suggested starting a pipeline project on mainstreaming DRR into the education sector in Cambodia, Lao PDR, and the Philippines. A special session was held, which was organized in coordination with UN-ISDR, which discussed the progress on the implementation of HFA by three RCC countries: Sri Lanka, Mongolia, and India. Sri Lanka shared post-tsunami institutional changes and implementation of the road map for a safer Sri Lanka. Similarly, Mongolia provided a brief overview of institutions related to DRR including the National Emergency Management Agency. Finally, India shared its progress by providing an overview of the establishment of the Disaster Management Act 2005, and National Disaster Management Authority. The next part of the session focused on the regional level progress of HFA, the presentation from UN-ISDR focused on three aspects, introduction to HFA and its priorities; status of HFA implementation at international, regional, sub regional and national level; proposed tools for implementation of HFA at national and community level like the Strategic National Action Plan (SNAP). Actions for the coming year were discussed and the session commenced with a report from the Steering Committee/RCC MDRD Advisor Panel. One of the key output of the RCC MDRD Advisory Panel was the development of “Kunming RCC6 Road Map” which operationalized Hanoi RCC5 statement on MDRD. 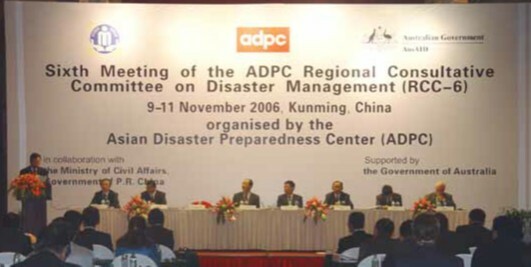 The road map including plan for RCC-MDRD program during 2007—2008 was approved by the 6th meeting of RCC disaster management at Kunming, China. RCC undertook four ongoing PiPs with 10 pipeline PiPs to be finalized between June to September 2007. Finally, a review of the progress made on the implementation of Hyogo Framework for Action was attained in a special session. After the review, the RCC members and delegates called for support from: UN-ISDR to provide guidance to implement the HFA; ADPC to provide technical assistance, advocacy, and coordination to facilitate information sharing; and the RCC to act as a monitoring mechanism that also contributes to information sharing with and between countries, thus consolidating progress of individual countries and documenting sector specific progress. • RCC undertook fourteen Priority Implementation Projects.